If you crave the creamy taste of ice cream but can't eat dairy because of your vegan lifestyle or lactose interolerance, vegan coconut ice cream might just be your dream come true. This sweet treat has all of the creaminess of real dairy ice cream, thanks to the inclusion of coconut milk, and it has a delicious tropical flavor. You may just end up convincing your non vegan friends to rethink that vegan diet after all. Oddly enough, one of the toughest things for a vegan to eat is dessert. So many desserts are heavily reliant on dairy products, which are a big no-no in a vegan diet. This vegan ice cream is a good work around, because it makes use of coconut milk rather than milk from an animal. The other important thing the ice cream needs is a thickening agent. Vegans depend on agar, which is a product similar to gelatin but is vegan friendly. Agar is made from seaweed whereas gelatin often has horse hoof or other animal ingredients in it. anything else that floats your boat! One word of caution before you start mixing your ingredients - you will need an ice cream maker to make this dish. If you want to save some fat and calories, you can use reduced fat coconut milk in your ice cream. If the taste is a little thin, you can use half reduced fat coconut milk and half full fat. Be aware that the full fat milk will make your ice cream taste creamier. Add a layer of complexity to your ice cream by adding a hit of lime juice. Play on the tropical theme by using mango, papaya and other tropical fruits in your dish. You can make a "banana" split using the coconut ice cream and grilled sweet plantains. 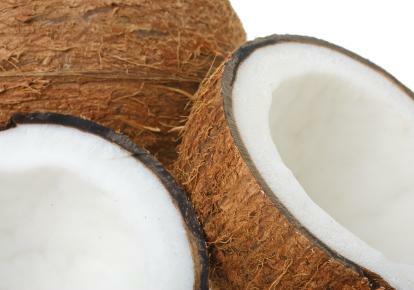 If you don't like the taste of coconut, you can cut it down by ramping up the amount of cocoa or other additives you use. iHow - A simple recipe for a straightforward coconut ice cream with maple syrup. Vegan Ice Cream Blog - Mango adds a twist to this coconut ice cream recipe. Kitchen Em - Feeling adventurous? This ice cream recipe starts with a whole coconut.